jefferyfreelance's review"Great Sounding Pedal That is Hampered by its Own Technology"
First of all, get it out of your head that this is a multi-effect device. It is not. It is a pedal that can morph into other pedals, but not on the fly. This pedal shows its diversity by being able to be changed when pedalboard changes are necessary, but not mid-song or while playing a gig. 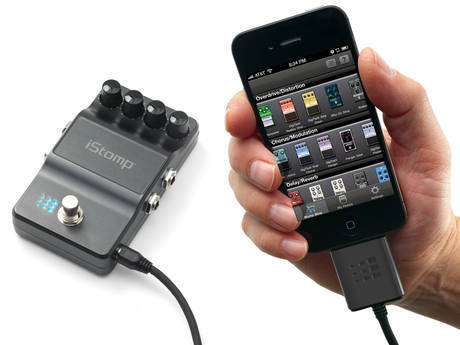 The iStomp does modulation, delay, reverb, compression, pitch, and filter effects well. These are the areas where digital is king above analog, and the iStomp is no exception. Several of the effects have mechanisms to allow for tap tempo, which can be useful in the right situation. The Red Coral Detuner and Rotator effects are my personal favorites, and they sound fantastic. It does a very good clone of the Memory Man, and several other famous delays. When you buy the iStomp you have the ability to change the pedal to any one of the forty plus options that are available. You no longer use the flanger, but need a compressor- no problem. Need an EQ pedal for your acoustic gig, but not the chorus that is loaded. Again, no problem. It takes roughly a minute to switch it from one e-pedal to another, then however long to dial in the settings. It is nice to try out pedals with your own rig, and not whatever amp and guitar are lying around at the local music store. Download an e-pedal, tweak the knobs, and know if it works with what you have. I was intrigued by the iStomp when I first heard about it, but the original price kept me at bay. I bought my first iStomp when it went on sale, and after having it for only a couple a of days quickly bought four more. I realize the inherent long term limitations of the pedal. Someday iPhones are not going to be available for changing the e-pedal on my iStomps, then they will become like any other pedal- limited to one sound. The tap tempo is a bit clunky, and not very gig friendly. The distortion patches are good, but not great. I like the way an analog distortion pedal reacts with other dirt pedals, and the iStomp does not have the same effect. I will mention that I love the Half-Pipe Overdrive, and if they ever made the analog equivalent of it I’d buy it in a heartbeat. Limiting it to the iPhone only was a mistake. A USB connection to any device would’ve been a better solution. Maybe this is not practical in the realm of software programming, but the iPhone changed to the lightning connector while the iStomp was still in production which caused issues. The inherent problems with this pedal is what sank it. I also believe that it was misunderstood, if you were looking for a multi-effects device in the traditional sense this is not it. I do like what it does, and as I mentioned own several that are on my pedalboard. I also am aware that their time is limited, but at a cheap price that doesn’t bother me. If you can pick up an iStomp cheaply, and you have an iPhone that can interface with it then I say do it. If nothing else it is a fun piece of gear to mess around with, and might help you decide on what other effects pedals you want to buy.